Fanny hooked me up with her friend Kati for a tennis date in Berlin. Super fun! I got to play on clay. Being unfamiliar with clay, it was a lovely surprise when the cute guy that was playing before us picked up the rake and cleared the court for us, then swept off the lines. Hilarious. 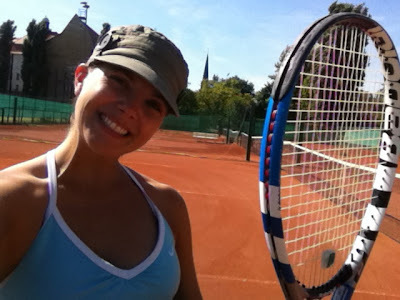 It turns out I love playing on clay, but I’m tentative because I have bad ankles and a history of breaking my feet while playing. But I loved it. Kati was a great rally partner and we discussed possibly rendezvousing in South Africa in November to surf and play tennis. I returned the favor for the 13 year olds playing after us.